Trimming dog nails is the responsibility of every pet's owner. Left untrimmed, the nails can become dangerously overgrown, and this can cause damage to your furnishings as well as your dog's feet. You can choose to have your vet or pet groomer perform this task for you, or you can trim your own dog's nails. Learn how on the following pages. The first thing you need to learn is how to locate the quick. The quick is the pink portion inside of the nail casing that delivers the blood supply to the nail. You need to avoid cutting the quick because it will bleed, and this is quite painful for your pet. It's easiest to spot the end of the quick if your dog has light-colored nails. However, you may still be able to see the quick if you shine a strong light on darker-colored nails. When you trim, you ideally want to cut off the excess nail just beyond the quick. If you're going to use a standard trimmer to clip your dog's nails, it's important to use the best tool for the job. The standard trimmer comes in two basic styles. The one pictured here is a guillotine trimmer. The dog's nail is placed in the circular opening, and the handles are squeezed together to eject the blade that pops out to trim the nail. This is not the best option because it also squeezes the nail and makes the dog more uncomfortable. Unlike the guillotine trimmer, the scissor trimmer pictured here cuts from both sides of the nail. This is a more efficient way to trim the nail, and it puts less pressure on the nail as it is trimmed. This typically makes the task easier. There is a small, flat guide you can position over the opening between the blades to limit how far you can trim the nail. This is especially useful with nervous dogs or dogs with dark nails. Working in good light, visually locate the quick, place your trimmer just outside of it and quickly squeeze the trimmer handles to clip the nail. Continue clipping each of your dog's nails until you have trimmed them all. Don't forget the dewclaws if your dog has them. These are the nails typically located a little higher on the inside of your dog's pasterns (ankles). Here is what freshly trimmed nails look like. The longer claw tips are now completely gone, and the nails have a neater edge to them. The one drawback of nails trimmed with scissors or guillotine style trimmers is that they can be rather sharp right after trimming. You'll definitely notice this if your dog paws at your hands or legs. To remedy this problem, follow up the trimming by gently filing the edges of your dog's nails to make them a little smoother. Although less common among pet owners than standard trimmers, the nail grinder is another tool you can use to keep your pet's nails neat and trim. The rotating stone on the grinder is gently pressed against the tip of the nail to grind away the excess while while also polishing the tip to prevent sharp edges. Learning to use the grinder takes practice, and you have to be extremely careful that no hair is caught in the rotating post. It is possible to grind too far and hit the quick, so always use the grinder in the best possible light. 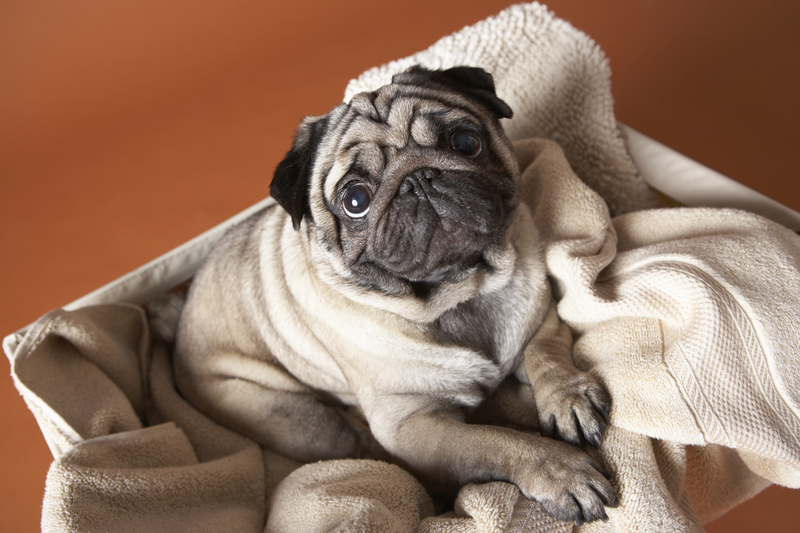 Once your dog's nails are trimmed, learn how to really clean a dog.